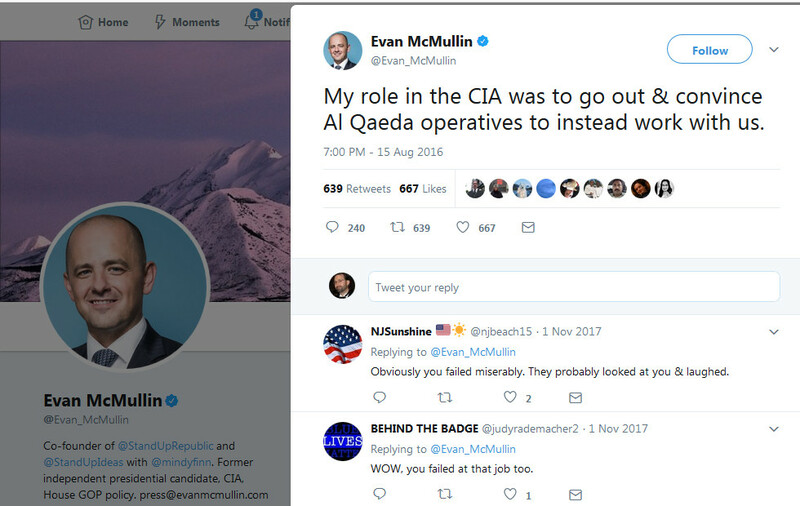 Always one of the odder presences on the Internet is Evan McMullin, former candidate for president, self-proclaimed point man for building the U.S. alliance with al Qaeda, rabid opponent of Donald Trump and, oddest of all, adopted favorite son of many anti-Trump “conservatives” and Republicans, to their everlasting shame. 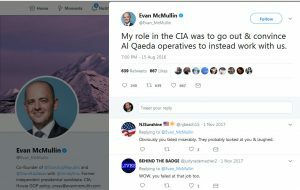 Lately, McMullin has been on a Twitter tear over the upcoming possible release of the FISA overview memo from the House Intelligence Committee. One has to wonder why, of all the things to get worked up about, McMullin is dedicating so much energy to this bit of proposed transparency for the American people. At first glance it does not seem like a likely hill for McMullin to die on. As someone long employed by the federal government, who has painted himself as having at least a veneer of ethics, the revelation of supposedly ongoing corruption within an important agency would seem like something McMullin would support releasing. If McMullin himself was not part of the corruption, why would he have a dog in the fight over exposing it? I think the answer requires first a look at why different groups oppose President Trump so viciously. Democrats, obviously, must oppose the president, and the more likable Trump becomes among voters, the more intensely Democrats will oppose him. This is more like physics than psychology, and not a very interesting topic to discuss. Republican opposition is a little more complicated. As noted in an earlier post, my personal opinion is that some opponents of President Trump consider him a monster for intending to fulfill Republican campaign promises of the past several decades. Republicans make promises that seem only meant to win votes from the rubes within their coalition, and never intended to become public policy. If Planned Parenthood were defunded, for instance, then what reason would “pro-life” organizations have to exist? And related are the candidates and their consultants whose aim is to get into office and get some of that sweet, sweet money and power, while not alienating the mostly liberal financial entities that help fund campaigns. No, what these types of politicos and issue organizations seem to need most are voters dumb enough to vote for their candidates year after year, and send them money, but also a government that will never enact their positions. Trump appeared poised to deliver on all the promises, which made him a mortal threat to the “conservative” fundraising and consultancy communities. But where does this leave Evan McMullin? He does not seem to be an actual tool of the Democratic Party, and whatever “conservatives” are in his circle of friends would also not seem to hold any sway such that McMullin would now become a loud voice against exposing corruption. “Pro-corruption” is, after all, a risky public position to take if one wishes to maintain respectability. It is a mystery for now, and perhaps a mystery that will be solved when and if the memo is released by the House Intelligence Committee. But let’s assume, and I think it is a valid assumption, that Evan McMullin is not literally named in the FISA memo. One of the factors about the FISA memo that does not get a lot of attention is that in itself, the document deals with the surface of an alleged criminal enterprise. The document is purported to address illegal surveillance by a lot of people who should have been doing nothing of the sort, people whose job was actually to guard against such crimes. That, in itself, is a big deal, the kind of deal that leads to potential long prison sentences. 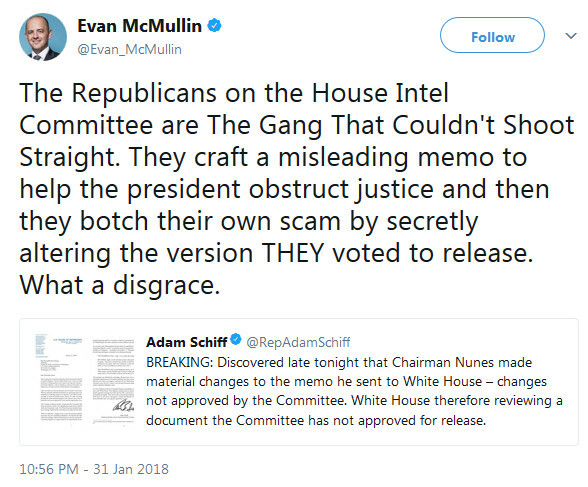 But that is not really what the memo is about. Bear in mind, the reason for the alleged surveillance of candidate Trump and then President Trump and all of the artifices built around the fake court filings (such as the Mueller investigation) appear to have been aimed at first keeping Donald Trump out of the White House, and second at destroying his presidency. And the purpose behind these shorter-term goals is what should really be of interest to the American people, because it may shed light on the layer of activity that Evan McMullin seems to wish badly to keep hidden from public view, and from history, and from the American judicial system. What were they so worried about President Trump’s administration uncovering? From this standpoint, the FISA memo is just the key to the first little gate to a sprawling enterprise. All the memo may do is allow us to see an edifice that up until now has only been rumored to exist at all. Exploring it will be a much more important effort, of far greater impact than this first outline of the surface crimes. Exploring the actual meat of the criminality will be a long-term project. And who knows that that will uncover. I can only guess. One hint may lie in the fact that in nine months the Trump Administration defeated ISIS with the same military that for some reason made almost zero headway for years, almost as though the U.S. was not trying to defeat ISIS at all. Almost as though before Trump the U.S. was enabling ISIS. What a weird thought that is. But for now, here are some nuggets from the very insightful investigative reporting at Last Refuge. Be sure to watch the short video of Tulsi Gabbard discussing her visit to Syria. 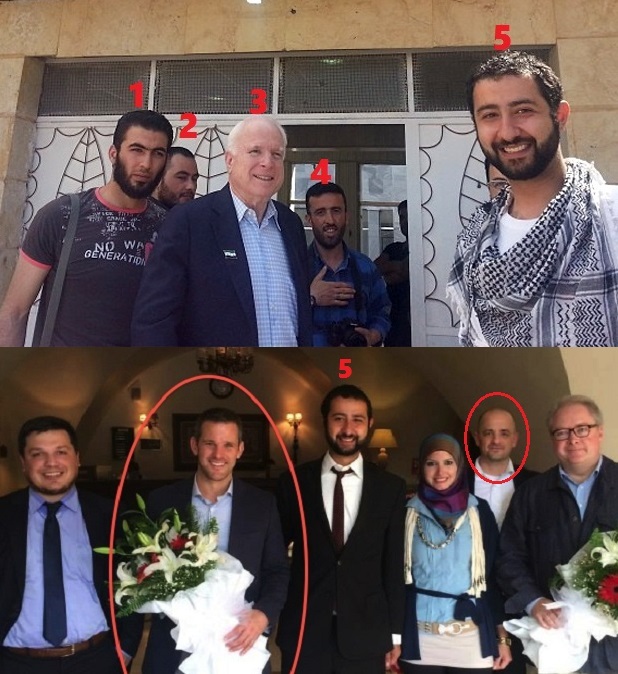 Why is the United States and its allies supporting these terrorist groups who are destroying Syria, when it was al Qaeda who attacked the United State on 9/11, not Syria. For more background, when you have time for a long read, check out the original Benghazi Brief which I think will eventually become a key part of the known history of ISIS. If not for Donald Trump, that story likely would have remained buried in a military intelligence blog. Just like, as some allege, if not for Donald Trump the United States would still be supporting ISIS. Could public knowledge of the U.S. role with ISIS be one of Evan McMullin’s fears? Hard to say, but we can be pretty sure that opening up the entire ISIS story for a fresh re-telling and reexamination might provide a valuable lesson for Americans. This is a story the Trump Administration should allow to be told.